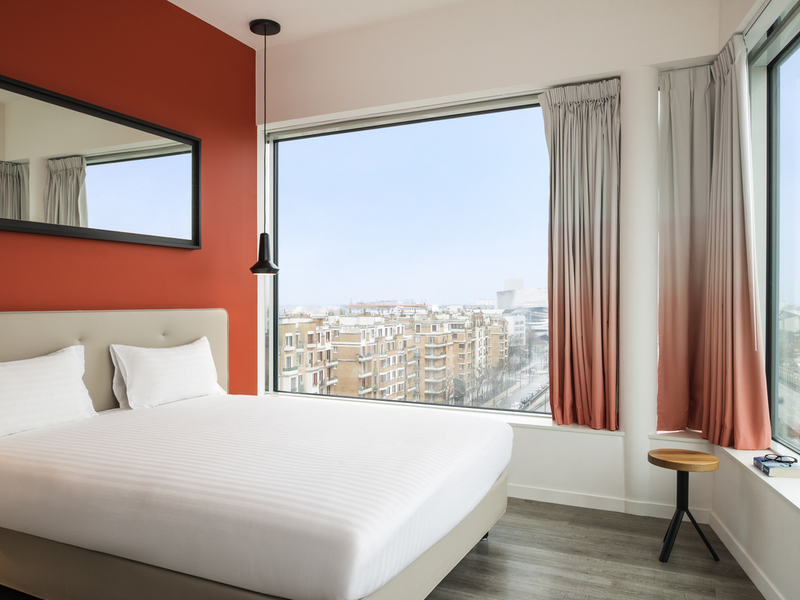 The Hipark by Adagio Paris la Villette is located in the 19th arrondissement of Paris, a stone's throw from the Parc de la Villette. The aparthotel has 125 fully furnished and soundproofed apartments with fully equipped kitchens for up to 4 people. It also features a fitness center and a meeting room. With nearby public transport links, guests can reach the center of Paris in 20 minutes. Our reception teams are ready to welcome you 24 hours a day. The hotel was generally ok, but I was frustrated by the poor wifi quality, my room was uncomfortably hot, and the bed mattresses kept coming apart leaving a pit in between. This was my fourth stay at the Hipark, but the forst since it is under new operators. A welcome addition is the availability of ready to heat meals at reception: althoiugh I did not need to use this service. The rooms are clean, but the pillows could be softer. I had done the on-line check-in to save time on arrival, but this proved to be pointless as my &quot;dossier&quot; was not ready, and I still had to pay with my card on check-in and sign forms. The receptionist did not seem to know about on-line check in and said Adagio and Accor procedures are still separate. ( Why ??). Also the request I had made for a room at the front of the hotel was ignored. There was a funny noise in the night from some kind of alarm half going off, but I coulodn't identify where the noise was coming from. The English language TV channel (BBC News) was not operational and reception could do nothing about it. Is this not an International hotel? Colleagues were placed at Mercure Hotel. I booked independently at Hipark Adagio. Very happy I did so - the room was very clean, well-appointed, convenient to the Parc de La Villette. This was in great contrast to my work colleagues' experience. Thank you for a great stay. It was nice. Staff is friendly & helpful. Cleanliness is good. Location is good. The staff is welcoming. The studio is extremely well decorated and fully equipped. Its perfectly clean and calm. Access is easy. It is a good hotel. Nevertheless, i did not know that the cleaning is extra before 8 days staying. That wasnt so good for me. The place is beautiful. Everything was made simple, staff were very friendly and helpful with our inquires. Room was fully equipped with all the necessary kitchen equipment such as plates, forks, knifes and more; however there werent any cups and for that we had to use the plastic cups in the bathroom to improvise. Overall, it was a great experience and I would definitely come back again one day! We were welcomed in a professional and friendly manner. very awesome, clean and modern appartement. Great & calm location. Close to transportation and many shops and restaurant are around. I'd definitely come back. The issues we experienced with our rooms and quality of support from the staff on our last day was terrible. The issues encountered include quality of accommodation, staff professionalism and availability. We emailed about this and received reply from an a Olivier Vernon who advised there would be an investigation but we have not heard back from this yet. On our first night room, number 803, was extremely uncomfortable due to the temperature. We spoke with Mehdi at reception who advised that due to the way the heating system is built, air conditioning could not be enabled on an individual room basis and the windows could also not be opened. Understanding this, we accepted, but found it unbearably uncomfortable and not that of an acceptable or regulated temperature. We did not have a pleasant sleep. We ensured the heating was turned off, but the temperature of the room was notably hotter than the halls and communal areas of the hotel, this led us to believe that there must have been a fault with the room. In the morning we spoke to another member of reception staff who claimed that there would be nothing that could be done, other than for a technician to check the room over the following day. We also noticed that some of the switches in the room caused a loud clicking noise from one of the cupboards but had no purpose, when enquiring about this the member of staff had not heard of this complaint before. We must reiterate that the temperature of this room was not just warm, it was unbearably hot to the point of feeling light headed or faint, with no way to regulate. At this point the only option provided by the reception staff member was to upgrade to an apartment room for an extra charge of €30 as we requested to move to a room with windows that would open. We were moved to room 806. We are disappointed that there was no effort made to confirm the nature of our complaint before requiring to pay for an upgrade. In room 806 the quality of the temperature, even without the windows being open, was much more bearable which further supports that the previous room was not fit for purpose. Our upgraded room suited us much better but still had it’s own faults such as the wet room smelling strongly of damp for our entire stay and a constant high pitched ringing noise produced by poor sealing to the window in the kitchen. On Saturday before we left for the evening, we spoke with two members of staff regarding booking a taxi to the airport in the morning. This interaction was playful and amusing at the time, but on reflection was unprofessional and indicated the quality of service we would later receive. When we returned that evening around 23:45, we came back to reception looking to confirm our taxi for our departure in the morning. We were waiting at reception for some time with no sign of an attendant before we heard some music from a speaker in the distance, we went to the breakfast room to find about five people sitting drinking beer. Someone in the room caught our eye and gestured to another person, one of the staff members we had spoken to earlier. They asked how they could help, he said they were having a meeting. We asked for an additional bin bag so we could tidy our room before checking out and also to confirm the taxi. He said he had forgotten our room number so wasn’t sure of the taxi. This whole encounter was unprofessional and added to the already negative experience with elements of the aparthotel. In the morning, we woke at 6am to start our journey to the airport. We went downstairs at around 06:05 to confirm our taxi had been booked and as expected there was no one present at reception. After returning to our room to prepare for departure, we organised other means of travel to the airport as we had no verification that the taxi had been arranged. We came downstairs to check out at 06:30, but still no one was present or available for us to even check out. We left a note written on a business card on the desk with our key cards. I suggest this will all be viewable on the CCTV of the lobby and illustrates some of the issues we encountered well. Our experience of our stay was mostly unsatisfactory and did not meet the expectations set by your website, specifically the 24/7 Reception availability. Based on this and the issues with the rooms, which required us to upgrade rooms at cost, we would request some form of compensation. Great and comfortable. There is only one thing I missed, cleaning the room every day. Our stay in your hotel has been OK, but we have observed room for improvement: What we liked: - Space - Friendly staff - Modern style Room for improvement: - Weekly cleaning - we did not expect this for the price paid and there are limitations: Dirt under the bed and under the desk. Not enough toilet paper when occupying the room with four persons - We could not open any window and the air condition did not provide enough fresh air - Breakfast room was very cold when the door is open (which was always during opening hours). Led to uncomfortable situation. Hotel & room were good. I was even very surprised by the quality if insulation as the hotel is closed from the ring. Issues: 1) The form I had to sign during check-in was inaccurate: bad nationality. 2) Even this survey was sent to my email and start by &quot;Dear OSEJI A.,&quot;: I'm not this person!!! 3) The biggest issue I faced was the heat inside the room was at 28,5° !! As the Indian guys at the disk just fully didn't care about this major issue, I just couldn't sleep as we can't open any window. 4) I can accept to not have A.C in October in Paris but there was also no airflow/ fan. 5) You also have a management issue as heat costs money to your company... In Conclusion I have lost one night of sleep, my money as I paid over 130 EUR. I don't plan to return in any Adagio Hotel. I've shared my experience within my company to unlist Adagio from our Residential list.